This book brings together psychometric, cognitive science, policy, and content domain perspectives on new approaches to educational assessment -- in particular, constructed response, performance testing, and portfolio assessment. These new assessment approaches -- a full range of alternatives to traditional multiple-choice tests -- are useful in all types of large-scale testing programs, including educational admissions, school accountability, and placement. This book's multi-disciplinary perspective identifies the potential advantages and pitfalls of these new assessment forms, as well as the critical research questions that must be addressed if these assessment methods are to benefit education. Contents: Preface. R.E. Bennett, On the Meanings of Constructed Response. R.E. Traub, On the Equivalence of the Traits Assessed by Multiple-Choice and Constructed-Response Tests. R.E. Snow, Construct Validity and Constructed-Response Tests. S. Messick, Trait Equivalence as Construct Validity of Score Interpretation Across Multiple Methods of Measurement. R.J. Mislevy, A Framework for Studying Differences Between Multiple-Choice and Free-Response Test Items. K.K. Tatsuoka, Item Construction and Psychometric Models Appropriate for Constructed Responses. N.J. Dorans, A.P. Schmitt, Constructed Response and Differential Item Functioning: A Pragmatic Approach. J. Braswell, J. Kupin, Item Formats for Assessment in Mathematics. R. Camp, The Place of Portfolios in Our Changing Views of Writing Assessment. D.P. Wolf, Assessment as an Episode of Learning. D.H. Gitomer, Performance Assessment and Educational Measurement. C.A. Dwyer, Innovation and Reform: Examples from Teacher Assessment. T.W. Hartle, P.A. Battaglia, The Federal Role in Standardized Testing. S.P. Robinson, The Politics of Multiple-Choice Versus Free-Response Assessment. 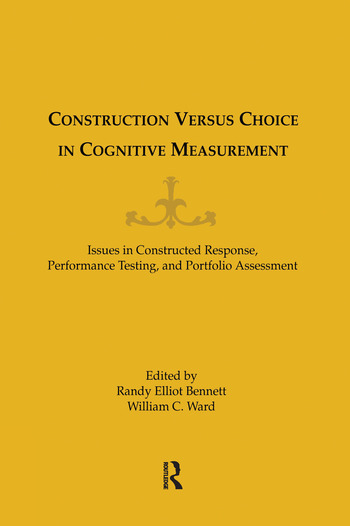 "Bennett and Ward have compiled a set of generally excellent essays from conference presentations and by invitation that address issues in constructed or performance-based testing....includes practical, technical, and theoretical issues in constructed testing....Recommended. Appropriate for graduate students in educational or psychological measurement or faculty working in that field." "...the chapters span a broad range of psychometric and social policy perspectives, there is something here for everybody....[they] provide a useful compilation of reference material and offer frameworks for logical, scientific developments that advance assessment..."